George Dawson Lane, 83, of Sale City died Friday, February 08, 2019 at Willson Hospice House in Albany. Graveside funeral services will be 2:00 p.m. Sunday, February 10 at Sale City Cemetery with Rev. Tim Bozeman officiating. 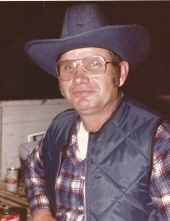 Born June 1, 1935 in Mitchell County, Mr. Lane was the son of the late James Wyatt Herley Lane and Wilma B. Hall Lane. He was a veteran of the United States Army. Mr. Lane was a retired diesel mechanic. Survivors include his son, Shawn Gleason (Jamie) of Lee County; two daughters, Kym Allison of Albany and Karen Gleason of Albany; sister, Elizabeth Jones (Leonard) of Huntsville, AL; two brothers, (his twin) James Lawson Lane (Betty) of Rossville, GA and Paul D. Lane (Margaret) of Sale City; four grandchildren and two great-grandchildren. "Email Address" would like to share the life celebration of George Dawson Lane. Click on the "link" to go to share a favorite memory or leave a condolence message for the family.